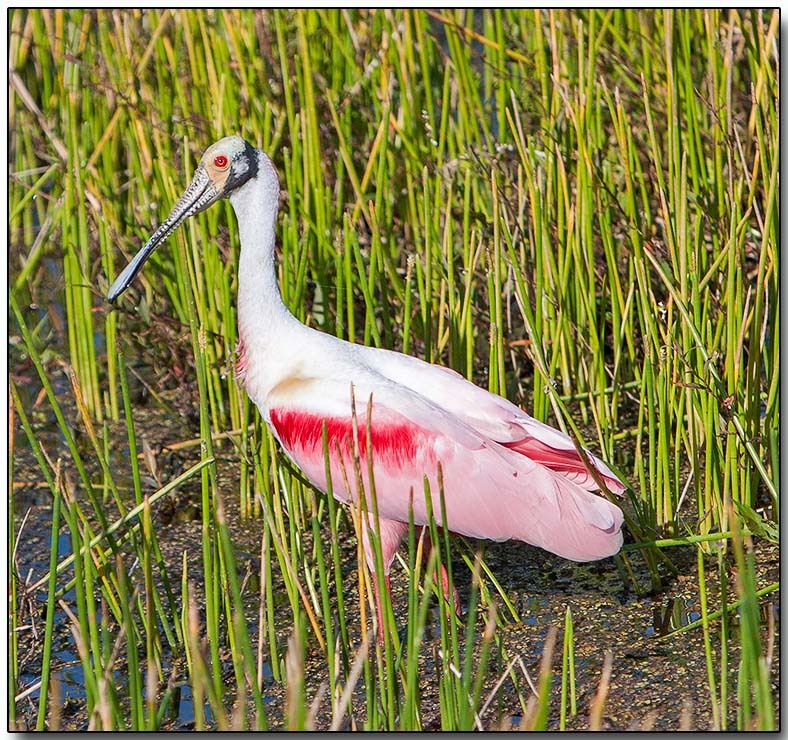 This long-legged wading bird is pink with red highlights, white legs and red eyes. The neck is long and white and is stretched out when the bird flies. Tail feathers are yellow to orange. The head is bare of feathers and grey-green. The Roseate spoonbill is named after the shape of the bill, which is 6 to 7 inches long and flattened like a spatula. This makes it easy to distinguish the Spoonbill from other pink birds such as the flamingo or the ibis. Locally common in marshes, tidal ponds, sloughs and mangrove swamps along the Gulf Coast of the United States, sections of Central & South America and the West Indies. The Roseate spoonbills main diet consists of fish, crustaceans and insects. It will on occasion also feed on aquatic plants and seeds. The bird wades while swinging the bill through the water. Whenever it feels movement the bill snaps shut to catch its food.